The mosasaurs recently took a star turn in the Jurassic World movie, showing off the Hollywood version of their fearsome jaws. 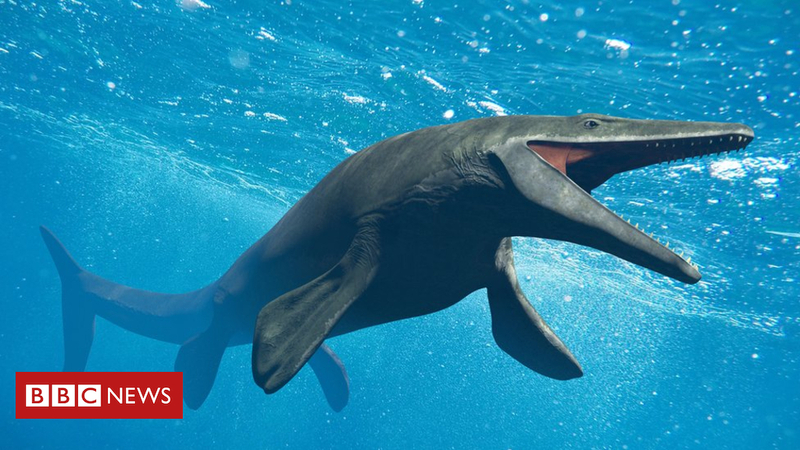 Now an “ugly duckling” from 85 million years ago is shedding new light on the giant marine reptiles that lived at the time of Tyrannosaurus rex. Scientists have long puzzled over how the diminutive fossil fitted into the family tree. They now think it was still developing the distinctive long snout of its clan. Takuya Konishi, a biology professor at the University of Cincinnati, took a second look at a small fossil unearthed more than 25 years ago in a rock formation in Kansas. He found a protruding snout – the telltale sign of a Tylosaurus, a type of mosasaur that grew up to 13m in length. Mosasaurs gave birth to free-swimming live young. The newborns might have had a different diet until they were fully grown, said Prof Konishi. The fossils represent the youngest and smallest specimen of its kind ever found.